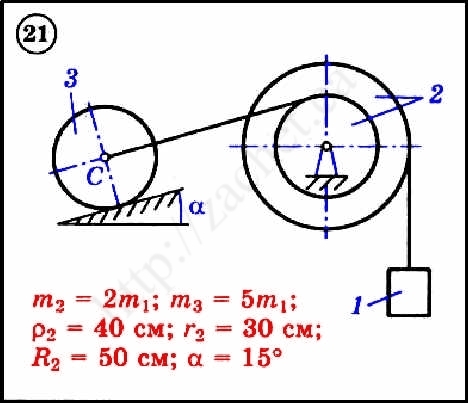 For the mechanical system presented on the diagram, using the theorem on the change in the kinetic energy in differential form, determine the linear acceleration of the body 1. The filaments are weightless and inextensible. Accepted designations: m - body masses, R and r - radii, ρ - radius of inertia (if not specified, the body is considered a homogeneous cylinder); In the presence of thorns, f is the friction coefficient of sliding, and fc is the friction coefficient of rolling.